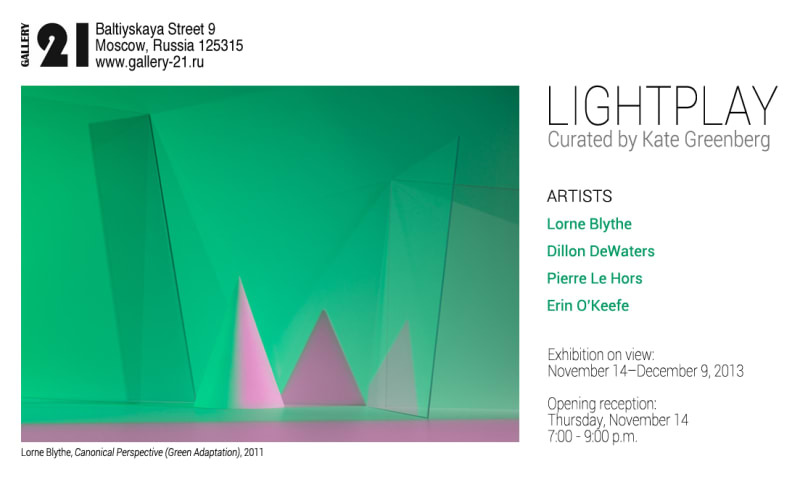 Opening reception Thursday, November 14, 7:00-9:00 p.m.
Gallery 21 is pleased to announce the exhibition Lightplay, organized by American curator Kate Greenberg, who recently returned to New York after spending the last year living and working in Moscow. The exhibition features photographs by four contemporary American artists all based in New York: Lorne Blythe, Dillon DeWaters, Pierre Le Hors, and Erin O’Keefe. Each of these photographers look to address the ideas of perception, ambiguity, and abstraction by creating images in which the camera is able to reveal things the human eye cannot perceive on its own. The exhibition takes its name from the 1930 film by the Hungarian modernist, László Moholy-Nagy, Lichtspiel Schwarz-Weiss-Grau or Lightplay Black-White-Gray. The film’s subject is Moholy-Nagy’s own kinetic sculpture, the Light-Space Modulator—an attempt to visualize and record the exchanges of light and shadow, pushing the boundaries of perception and making new demands on the eye. Moholy-Nagy was an early practitioner of abstract photography and used his camera to create optical distortions. In his seminal text from 1925, Painting, Photography, Film, he writes that the camera can “make visible existences which cannot be perceived or taken in by our optical instrument, the eye.” He goes on to explain how “the eye together with our intellectual experience” is able to turn “optical phenomena” into a “conceptual image.” Thus, as Moholy-Nagy puts it, the photographic camera is “the most reliable aid to a beginning of objective vision.”1 Moholy-Nagy’s influence is present within the works shown in Lightplay, as each of the photographers attempt to expand and experiment with the notion of perception in the modern-day environment. Erin O’Keefe’s work is concerned with spatial perception and the terrain between two-dimensional representation and the three-dimensional space. In her series On Paper, she covers a simple piece of paper in paint and then folds it up. She photographs the paper several times, moving the light source to create different images of the same thing. The resulting photographs prove how effortlessly she is able to decontextualize the paper’s original purpose and create an illusion of three-dimensionality. In a more recent body of work, Collection, O’Keefe assembles various source images of sculptures and arranges her own “sculptures” for the camera, further pushing the sense of ambiguity and mystery. Pierre Le Hors’ practice is concerned with repetition and abstraction. In his 2012 series and resulting book, Patterned Standards of Scenic Dressing, Le Hors arranges polka-dot fabric in a wide variety of set-ups in the studio—an attempt to exhaust a finite set of visual possibilities. Using a range of photographic tools, including multiple exposure, Le Hors creates images that present the fabric with varying points of focus—a pattern, a fold, or a line—in order to breakdown the hierarchy of the subject and the picture plane. The viewer’s perception is further challenged when the fabric is layered to create a third interference pattern, such as “moiré,” further negating the meaning of the original object. The entire layout of the book will be displayed as an installation for the first time as part of Lightplay. Dillon DeWaters creates images influenced by film and science fiction that are metaphysical, colorful, and highly elaborate. DeWaters uses various techniques to challenge the image as seen by the viewer: bright colors, creative lighting, multiple exposures, homemade gradient gels, and expired or fogged film, all of which create a sense of illusionary scenes. In one image he uses lighting so delicately that the viewer is left to accept that a hand is floating in midair. In more recent work, DeWaters ventures out of the studio and into the landscape environment, focusing on everyday objects such as rope and bricks to create complicated images that leave subtle clues for the viewer that things aren’t always as they seem. Lorne Blythe’s photographs often focus on familiar everyday objects—plexiglass, dice, mirrors, razors, and balls—that are decontextualized in the studio. The influence of Czech modernist Jaromír Funke’s photographs, along with many of the ideas present in Moholy-Nagy’s “new vision,” are apparent in Blythe’s work. Referring directly to Funke, he creates images that play with reality and emphasize the abstract. Connected to his interest in the avant-garde, Blythe also focuses his attention on vision tests that are concerned with spatial ambiguity and manipulation of human sight. In Lightplay, Blythe recreates a number of vision tests from the mid 1970s in which the viewer’s perception is directly challenged.